President Trump’s campaign did not conspire with Russia during the 2016 election, according to a summary of Special Counsel Robert Mueller’s report submitted to Congress on Sunday. The report summary did not draw a conclusion as to whether Mr Trump illegally obstructed justice – not exonerating the president. Mr Trump, who repeatedly described the inquiry as a witch hunt, said on Sunday that “it was a shame that the country had to go through this”, describing the inquiry as an “illegal takedown that failed”. The report is the culmination of two years of investigation by Mr Mueller which saw some of the president’s closest former aides prosecuted and, in some cases, imprisoned. “While this report does not conclude that the president committed a crime, it also does not exonerate him,” Mr Mueller wrote in his report. What is in the report summary? The summary letter by Mr Barr outlines the inquiry’s findings relating to Russian efforts to influence the 2016 presidential election. The second part of the letter addresses the issue of obstruction of justice. Mr Barr’s summary says the special counsel report “ultimately determined not to make a traditional prosecutorial judgment”. “The Special Counsel therefore did not draw a conclusion – one way or the other – as to whether the examined conduct constituted obstruction,” the letter read. Mr Barr says that the evidence was not sufficient “to establish that the president committed an obstruction-of-justice offence”. Mr Barr ends his letter to Congress by saying he will release more from the full report, but that some of the material is subject to restrictions. “Given these restrictions, the schedule for processing the report depends in part on how quickly the Department can identify the [grand jury] material that by law cannot be made public,” he wrote. Who’s who in the drama to end all dramas? How have US politicians reacted? 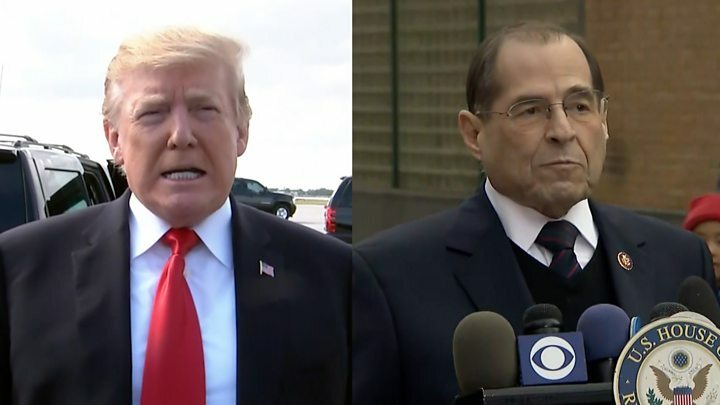 Congressman Jerry Nadler, the Democratic Chair of the House of Representatives Judiciary Committee, emphasised that the attorney general did not rule out that Mr Trump may have obstructed justice. Key questions remain about whether Donald Trump was compromised as a candidate & is now as President of the United States. Ongoing investigations in other federal prosecutorial offices as well as the FBI’s counterintelligence inquiry must be supported. White House press secretary Sarah Sanders described the findings of the report as “a total and complete exoneration of the president”. Mr Trump’s lawyer, Rudy Giuliani, said the report was “better than I expected”. Republican Senator Mitt Romney welcomed the “good news”, tweeting that it was now “time for the country to move forward”. A number of senior Democrats have called for the full report to be released along with all of the special counsel’s investigative files. Mr Barr has said he will release more, but indicated it would take some time to determine what materials could be shared. He did not give a specific time frame, but whenever further details are handed to Congress Democrats may mount legal challenges if it is anything less than the entire report. As Congress awaits further details, Mr Barr may be called to testify in front of the House Judiciary Committee. The committee’s Democratic chairman, Jerry Nadler, said on Twitter that he will ask Mr Barr to testify “in the near future” over what Mr Nadler said were “very concerning discrepancies and final decision making at the Justice Department”. Meanwhile, as Mr Trump claimed “total exoneration” on Sunday, about a dozen other investigations were continuing to examine his activities. They include a federal investigation in New York that is looking into possible election-law violations by the Trump campaign and his businesses and possible misconduct by the Trump inaugural committee. In his four-page letter to Congress, Attorney General William Barr summarises, mostly in his own words, the conclusions of the special counsel’s investigation. In one key line, however, he directly quotes the report.